Inner Thigh Stretches to stretch the inner thighs. Check all thigh stretching exercises to build a flexible body. Sit on the floor with feet together and facing each other. Grab hold of your toes and let your arms rest on the thighs. Take hold of your feet and pull them as close to your groin as possible pressing your elbows for a complete stretch. • This exercise begins in a lunge position. • Then repeat the stretch again. • When doing the exercise, exhale when you step out the leg and inhale when you bring back the leg to position. 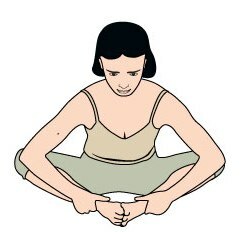 • Starting in a kneeling position, step one leg out outside in a lunge while bending forward and using your outstretched hands for support by placing them on the floor in front of you. • Straighten the leg as far as possible. • Then return to the starting position, and stretch out the other leg as far as you can go.